The Nonfiction Detectives: Rah, rah, radishes! a vegetable chant! by April Pulley Sayre. Rah, rah, radishes! a vegetable chant! by April Pulley Sayre. Rah, Rah, Radishes! a vegetable chant! Reviewers copy of this book was checked out from the public library. So begins this lively ode to the many interesting, unusual, yet yummy veggies found in gardens, grocery stores and farmer's markets. Large color photos taken by the author show not just the usual varieties, but other kinds found throughout the world. We see bright orange carrots alongside heirlooms in deep reds and yellows. Eggplants, brussell sprouts, peas, corn and more! The book is great to use with all ages. A poetry unit with high school students. Elementary children will appreciate the fun while they are learning about good nutrition. Preschoolers will be clapping hands in story time. (Saying, "Yuck" to those vegetables they don't like). 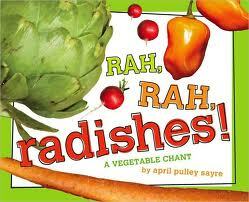 Rah, rah, radishes would be excellent for a Readers Theatre group! Sun and season, leaf and stalk. April Pulley Sayre has some suggestions for performing Rah, rah, radishes with students.